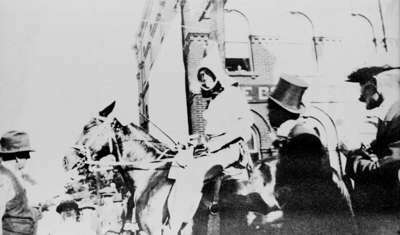 Black and white image of a man on horseback possibly wearing Ku Klux Klan outfit. This was part of the Pavement parade in downtown Whitby. They are pictured in front of the Dominion Bank at the south-east corner of Dundas and Brock Streets. Brock and Dundas Streets were paved in 1921. The Honourable F. C. Biggs, Minister of Public Works, dedicated the pavement in a special ceremony at Brock and Dundas Streets. There were 40 floats in the parade. This image is from a scrapbook in the following location: F 21 Leonard Beckley fonds, box 4, file 1.